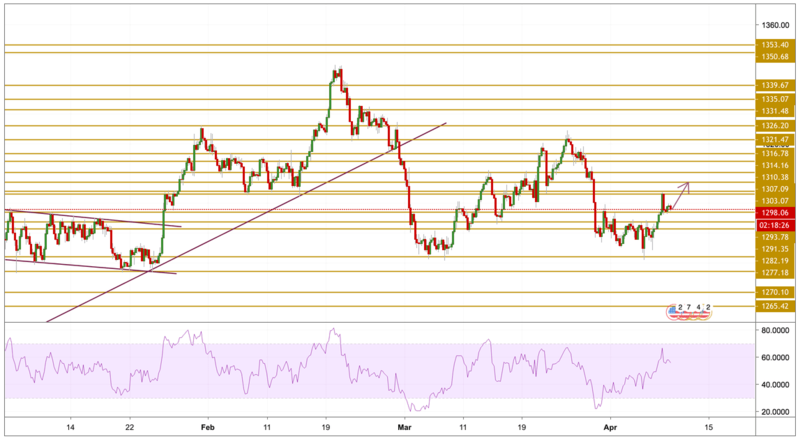 Gold prices are trading near $1298 early this morning after rising to a two-week high yesterday as hostilities in Libya and the US President’s another hit to Iran grabbed market attention. Headlines concerning the Libyan National Army’s march to acquire the capital Tripoli and Donald Trump declaring Iran's revolutionary guard as a terrorist organization helped the Gold to remain strong during yesterday's session. Moreover today, investors welcomed the development from the UK that favored an amendment rejecting a no-deal Brexit. The risk-off sentiment got additional support when the Trump administration announced a ban on 16 Saudi nationals from entering the US due to their roles in the murder of journalist Jamal Khashoggi. Saudi Arabia is still to respond to the ban and may generate news reports during the day.